A military contractor contacted Oseco with a design issue. The use of lithium batteries in their application presented an explosion risk and they needed an innovative solution. 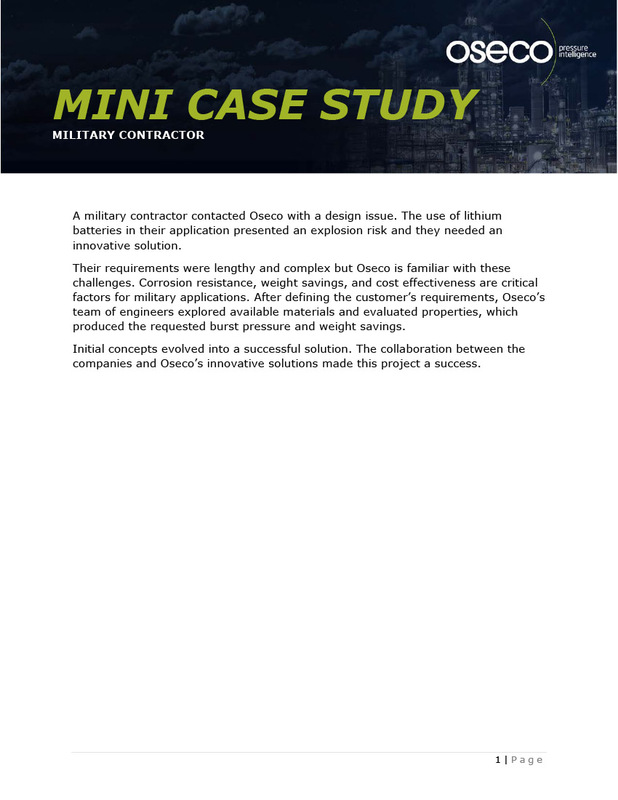 Their requirements were lengthy and complex but Oseco is familiar with these challenges. Corrosion resistance, weight savings, and cost effectiveness are critical factors for military applications. After defining the customer’s requirements, Oseco’s team of engineers explored available materials and evaluated properties, which produced the requested burst pressure and weight savings. Initial concepts evolved into a successful solution. The collaboration between the companies and Oseco’s innovative solutions made this project a success.